Pipe Wrench is a local plumbing & mechanical contractor servicing Shelby Charter Township MI, and the surrounding areas. Whether your looking to upgrade with a 3/4″ gas supplied tankless water heater or up-size the capacity to a power vented 50 gallon tank, our expert plumbers can recommend the best value for your investment. We began this career 20 years ago as a Water Heater Installer with a great track record for a high client satisfaction rate & minimal customer call backs. 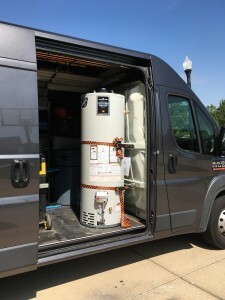 When the time comes to replace that leaking water heater, our licensed plumber will deliver & connect the new tank, perform any necessary pipe repair & mechanical code upgrades, and also remove the old unit to the curb for regular pickup. Our plumber will store and transport all water heaters upright, as suggested by manufacturers, to ensure the integrity of the inner glass lining. We can determine whether that dripping temperature & pressure (T&P) relief valve needs to be replaced, or if it’s a “closed piping system” requiring the installation of a thermal expansion tank. After the new tank is up and running, the technician will verify that the temperature is set, check for any leaks, and make sure the combustion gases are venting properly. Our heating technicians are skilled and experienced in connecting indirect water heaters thru a double walled heat exchanger piped with the homes boiler system. This illustration depicts the typical diagram for a hot water heater return system. The purpose is to maintain a constant water temperature as close to the faucet as possible so users will not have to waste precious water waiting for it to get hot. The Michigan Plumbing Division adopted the modern energy code rule that requires hot water source to be within 50 feet of the end use. This would technically require most larger homes to install a hot water return system. Some additional needed code upgrades associated with this would be to install a check valves & a thermal expansion tank. © 2018 Pipe Wrench L.C.